When I wear colour on my lips, you can be sure that 9 times out of 10 it is likely to be something that is long lasting. I have never been that great at remembering or bothering to reapply lipstick/gloss throughout the day. So naturally, I always steer towards the lip stains and long wear lip products when I am in any beauty department. I already have two YSL Glossy Stains, which I absolutely adore but decided that I should try and find similar products slightly more purse-friendly! Enter the L'Oreal GlamShine Stain Splash. Seeing as L'Oreal and YSL are essentially the same company, it is not surprising to learn that the products are quite similar. 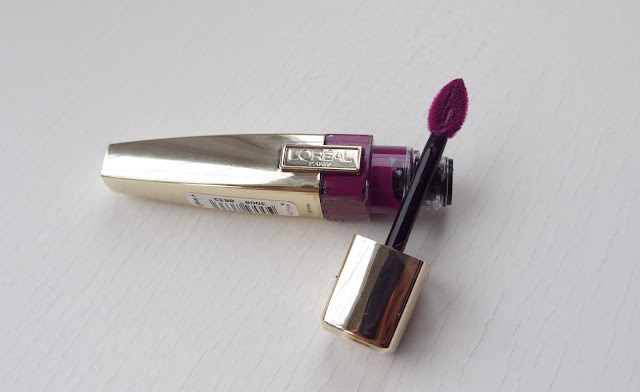 The biggest difference being the price; the L'Oreal GlamShine Stain Splashes are almost a third of the price of their YSL equivalent (sometimes less, as they are often on offer at some retailers), a pretty dramatic difference! I've got two; Bonnie, a lovely orangey colour and Milady, an intense bluey purple. 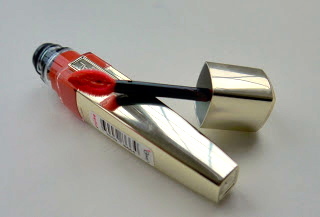 So, how does L'Oreal's lip stain compare? The answer here is very well; they colours are great (although YSL does have more at the minute) and they last just as well on the lips. The product, like the YSL Glossy Stains give the perfect amount of 'gloss' and are not at all sticky or uncomfortable to wear. I find them to be quite hydrating, I normally always put lip balm on before using lip colour, but that is not necessary with these. As far as packaging is concerned, they are both good looking products. You wouldn't know that the L'Oreal product is significantly cheaper than the YSL. I am hoping more colours come out in the L'Oreal range, they are certainly worth stocking up on!